As many people and organizations continue to seek refined and more effective ways of contributing to the development of the continent as a whole, quite a high number of varied exchange programs almost everywhere in the world have sprung but the Meridian International Center’s Business and Entrepreneurship Exchange Program (BEEP) is in a league of its own. There could not have been a better way of empowering emerging business leaders than through an exchange program of this caliber. The greatest part about this program is not the obviously visible experiences that participants go through; it is the invisible impact that happens in the secret, deep chambers of the heart where determination, hope, and inspiration dwells, being the combined driving force of an individual to make great accomplishments in life. Cohort 1 Meets at Meridian’s Campus in Washington, DC. The news that I had been selected in the final six emerging entrepreneurs from Zimbabwe to participate in the BEEP was the best news I had received in the year 2014. I recalled the first time I was told about BEEP by my sister (former employee of World Education Inc – a U.S. Agency for International Development (USAID) funded project in Zimbabwe); how I thought I probably wasn’t fit for this program, and how I thought I could never be selected because I was in agribusiness, an industry riddled with international controversy. I just could not believe it! So was I really going to go to the United States and be connected with an American farm? Wow! I also remembered how a close colleague of mine kept magnifying my talents and achievements whilst I was doubtful of the value these little achievements had when I was contemplating whether to apply or not. This is what he said to me, “Gerald, I know you are a perfectionist and always set high targets for yourself, but the little things you have achieved thus far are remarkable! Literally you have kept your agribusiness going on for almost two years, providing quality, fresh farm produce in an environment where more than 75% of start-up businesses fail within their first 2 years of operation.” So I applied for BEEP with all the determination and high expectation of success. 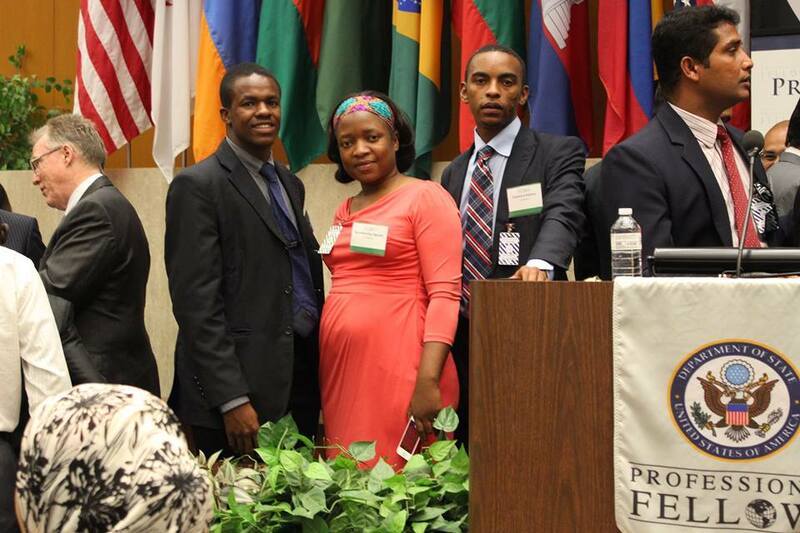 Gerald, Moreblessing and Tafadza at a U.S. Department of State Regional Briefing event. During my entire stay in the United States, not a day went without learning something about the American culture, ways of doing business, and its democracy and systems of governance. The first week in Washington, DC was characterized by learning workshops on these areas and site visits to various historic sites and of course I got to enjoy the American food. The next three weeks were in Denver, Colorado and they were very crucial as this was where I was going to spend more time living with an American host family and working at an American farm. I was given a very warm welcome and became very close to my host family, my mentor and my mentor’s family (when it was time to say goodbye at the end of the three weeks, it was such a somber moment with Lucy – my mentor’s seven year old daughter – having watery eyes). The experience at the farm was one of a kind as I got to be involved in the day to day operations of the business. This was the best way to learn as I would ask every kind of question, including the ‘silly’ ones. I am happy because everyone at the farm was patient and gave me answers to everything. Key learning areas included irrigation techniques, labour management strategies, planting methods, and marketing strategies. I also got the opportunity to tour a canning facility, MM Local Foods, that produces a wide range of canned crops such as pickled onions and canned apples to mention just a few. There were also networking events and through this I established a good relationship with a consulting firm that helps develop sustainable agriculture in Africa. After the three weeks ended, I returned to Washington, DC for the final week. It was a great time for feedback on everyone’s experiences and a business plan pitch competition. The completion was very unique and we made presentations in the presence of our competitors – scary but awesome! It was a significant event for me as my business plan pitch, “Realizing the Afro Dream through sustainable agriculture and education,” took the third prize (more details can be found on www.greatmountains.co.zw). 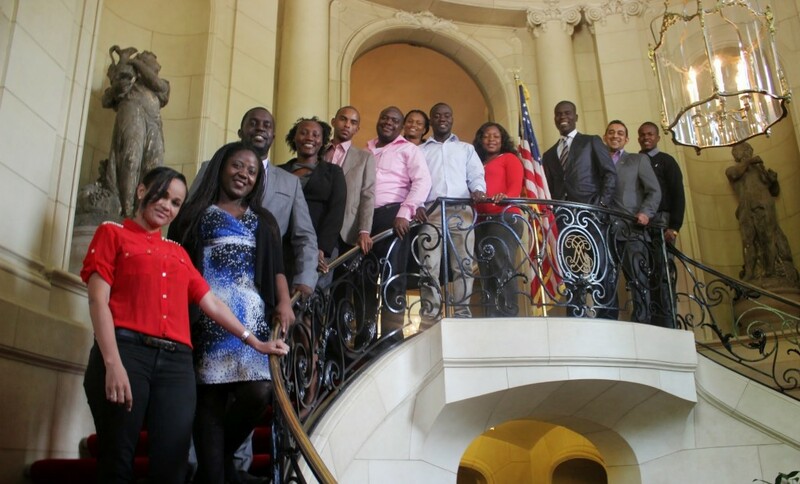 The program ended with a two-day congress for other 184 Professional Fellows that were on similar exchange programs in different states in America. This was another great opportunity to network and indeed a lot of relationships were established during this congress. So as can be seen, many small footprints have been made by the BEEP program that will transform me into a world class businessman; from the application process, the news of having been selected, the learning workshops, the networking, the placement learning, the platforms to speak and communicate my vision – with great applause and affirmation from various audiences, the partnerships, to the happy moments shared with friends, host families, and various facilitators. I can say all these tiny footprints culminate into a great leap from a world of mediocrity into greater vision; another great leap from having a not so well articulated vision to establishing a clearer vision and direction of where my business will be going. One cannot see the transformation that is taking place within me, but the results in the near future will testify of the goodness of such a program. It’s like the wind: you can never touch it nor see it, but you definitely can see and feel its power! The Professional Fellows Program with Zambia and Zimbabwe is sponsored by the U.S. Department of State’s Bureau for Educational and Cultural Affairs and implemented by Meridian International Center. For more information visit www.meridian.org/beep2014. POST TAGS: Agriculture, International Exchange, Public Diplomacy, U.S. Department of State, Youth, Zimbabwe.